This one is for all the moms out there. We understand that getting ready for the new school year can be stressful and a chaotic mess. 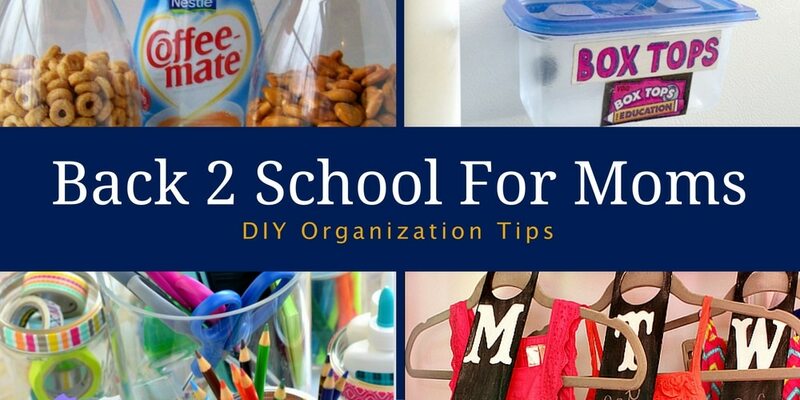 To help alleviate some of that stress and mess, we found a few DIY organization projects that can be done to help you and the kiddos have a smooth transition from summer vacation life back to the daily school life grind. Enjoy! Yes, Box Tops are still a thing and yes, they are still a pain to keep track of. Thanks to Adventures In Wunderland and General Mills®, here is a quick fix to loosing all your tops. To start this project, Wundermom first decorated her container with the Box Top logo found on the packaging of General Mills products. To do this you will need mod podge and a foam brush. Paint a layer of mod podge onto one side of your container. Take your cut out logos and place them on top of the mod podge. Hold them in place for a few seconds to make sure they stick. Once that layer has dried adequately you will paint a second layer of mod podge over the top of the cut outs. Let this dry completely. Once your labels have dried you can start the next step. With your utility knife, cut a small “X” in the center of the container lid. Now you are ready to add your magnets. WunderMom used hot glue for this, but a strong super glue would work as well. Place a small dot of hot glue onto one corner of the back side of the container. Press your magnet to the glue until it has dried in place. Repeat this step with the remaining magnets on each of the back corners of the container. And that’s it! 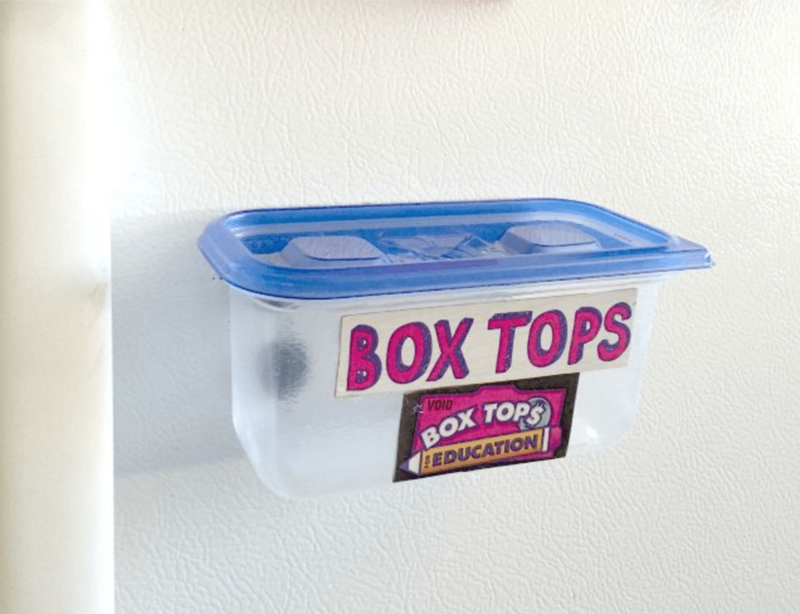 Now you can easily add the Box Tops through the opening in the lid. All text and images are credited to WunderMom and AdventuresinWunderland.com. Homework can go one of two ways: Quick, easy, organized and painless or slow, hard, messy and painful. Thanks to Mom On Time-Out, here is a great way to keep homework supplies in order and easy to find. Gather the necessary materials for the project and clean the surface of the rotating turntable and bottoms of each mason jar. Make sure everything is dry before getting started. Use a ruler to measure six, triangular sections and mark with a pencil. You want them all to be the same size. Following the lines as a guide, adhere washi tape in the pattern or color of your choice to divide the sections. Cut the end of the tape for a cleaner look. You can use different washi tapes for each section but Mom On Time-Out thought it looked a little nicer using the same one. Plan the layout of the jars, by placing one jar towards the edge of each triangular section, until you settle on the placement. Mom On Time-Out used three larger jars, three smaller jars and one large plastic container in the center. To decorate the first mason jar, first remove the lid by twisting off the metal band on the jar until it is loose enough to slide off. Then, remove both the band and the lid from jar. Discard the lid. Decorate the band by applying washi tape in the pattern or color of your choice all the way around the exterior of the band, smoothing with your finger as you go along. Cut the tape (instead of overlapping it) for a clean look. Mom On Time-Out used blurred lines, cracked, pink quatrefoil, big zig, alphabet and feather patterns on the bands. Repeat steps 5-6 to decorate the remaining mason jars. To secure the jars in place, first cut the Scotch® All-Weather Fasteners in half – to fit the bottom of the mason jar. Remove liner on one side of the fastener and apply to the bottom of the mason jar and press firmly. Remove liner on the second side of the fastener and apply to the surface of the rotating turntable where you want to place the jar. NOTE: Each inch of product holds up to two pounds. Align the fasteners and attach the jar to rotating turntable by pressing firmly together until you hear a snap, indicating closure. You’ll know when it’s secure! Repeat steps 8-10 to attach the remaining mason jars to each section and the cylindrical plastic container to the center of the rotating turntable. Mom On Time-Out used two sets of fasteners to attach the center plastic container to the turntable. Now for the fun part! 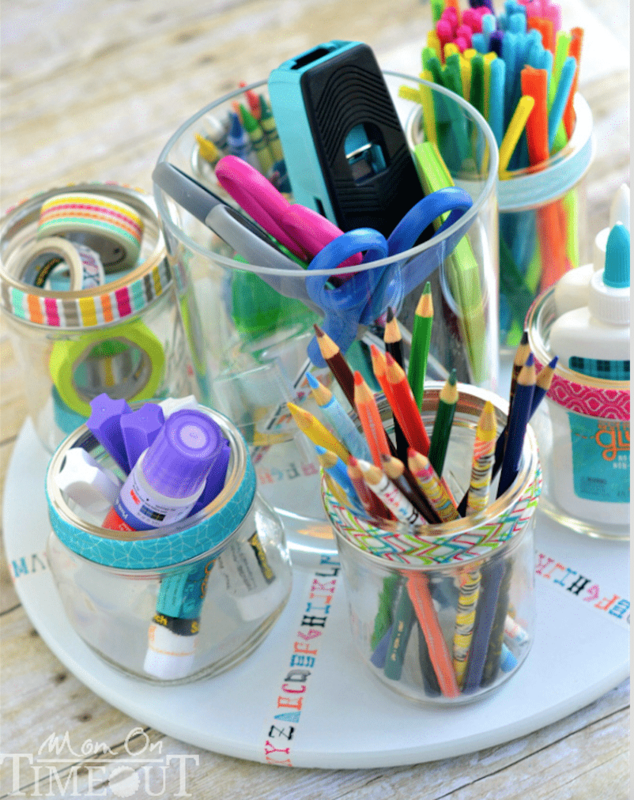 Fill the cylindrical container and mason jars with homework supplies and place in your homework area to keep supplies organized and accessible. All text and images are credited to MomOnTimeOut.com. 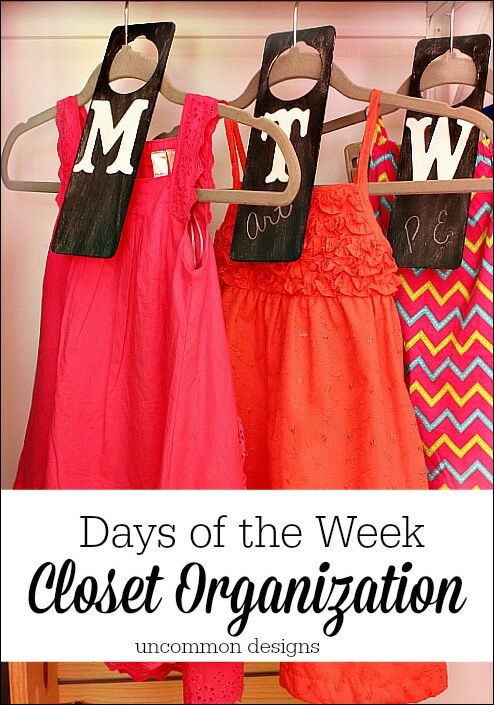 Apply two coats of the chalkboard paint to each door hanger. Let dry completely between coats. Paint each of the chipboard letters with the white acrylic paint. Uncommon Designs applied two coats. Season the wooden hangers by rubbing chalk on the front and wiping it away with a paper towel. Glue the letters to the front of the wooden hanger. You are done! All text and images are credited to UncommonDesigns.com. Organization is key when it comes to kids and that includes being able to organize snacks and food in easy-to-access containers. Thanks to Stock Piling Moms, this rather quick and simple project will definitely save you the headache of snack wrappers and extra boxes all over the place. 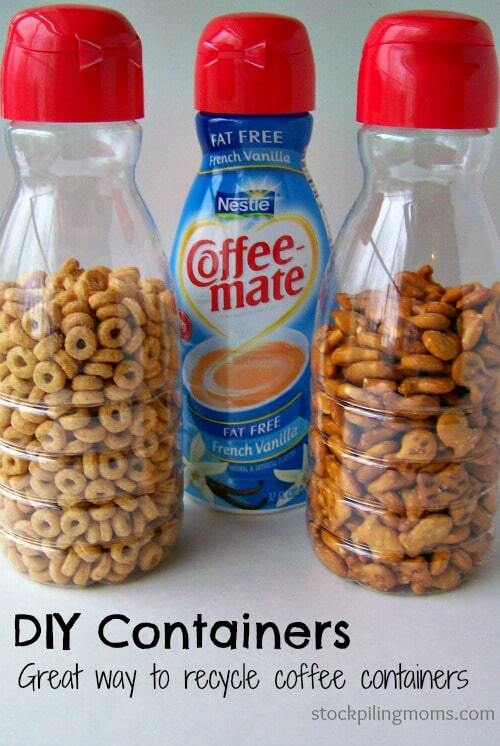 These containers are super easy to make and the hardest part about them is removing the coffee creamer smell from the bottle. Stock Piling Moms suggests filling them with vinegar and soaking them over night in your sink or putting crumpled up newspaper inside them and then re-washing. Other than that, you simply need to remove the labels and you are good to go! All text and images are credited to StockPilingMoms.com.